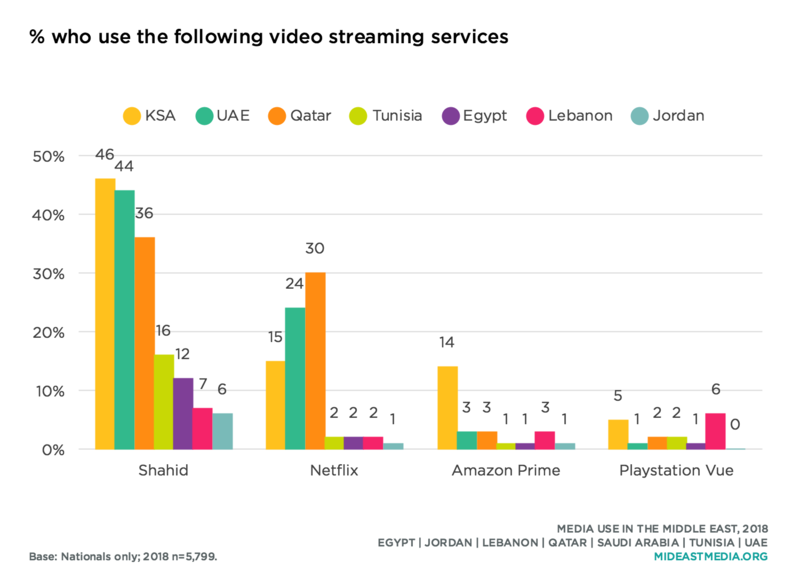 The proportions of Arab nationals who regularly access entertainment on a range of digital and non-digital platforms are increasing, but not for TV. While the share of nationals who watch TV is greater than that for any other medium, and is close to saturation in most countries, daily use of TV fell significantly since 2016 (64% of nationals surveyed in 2016 vs. 54% in 2018), while daily use of certain other platforms rose in the same time period (watch any online video content: 30% in 2016 vs. 40% in 2018; listen to music online: 22% vs. 28%; watch films online: 9% vs. 15%). Moreover, the percent of nationals who watch specific types of TV—series, films, news, and music on a TV set—dropped by about 10 percentage points each since 2016. At the same time, the percentages of nationals who access these same media genres online, and also on a phone specifically, grew by about five to 10 percentage points. 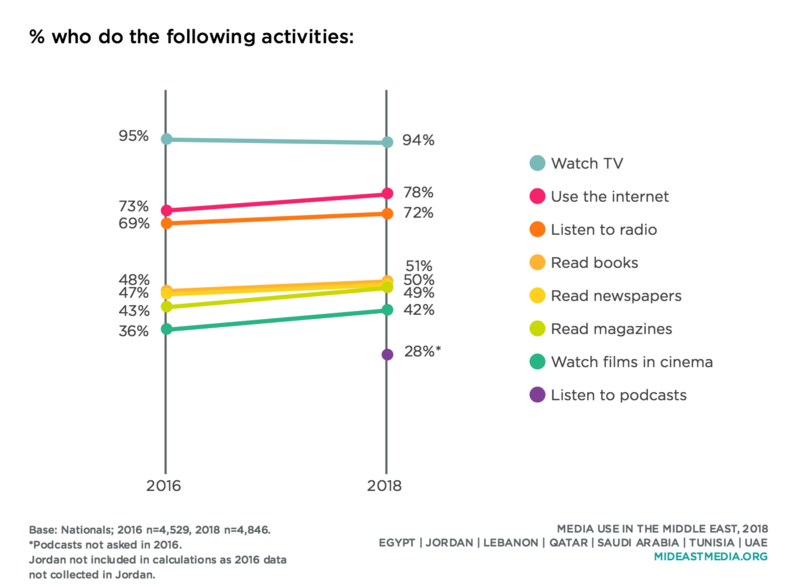 While media platform preferences are changing, the languages Arab nationals use to access media have not changed much. 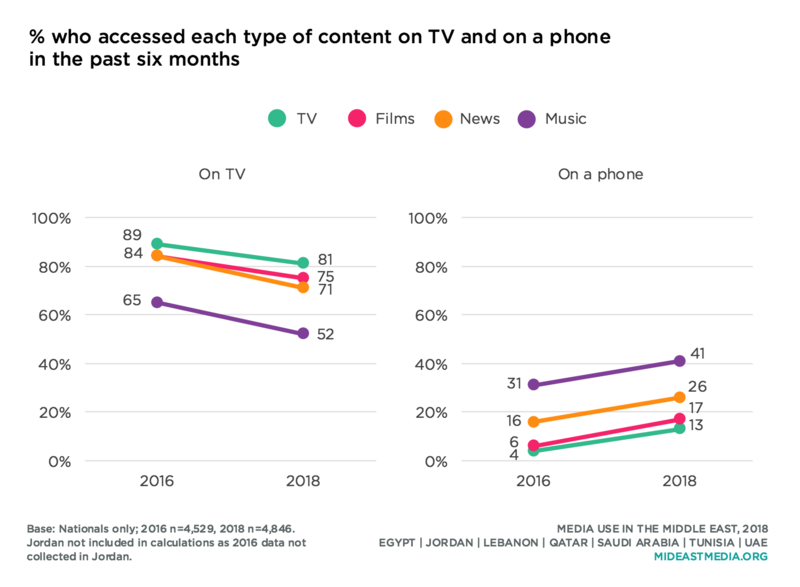 Between eight and nine in 10 nationals access Arabic-language TV, music, and film content—roughly the same proportion as in 2014. Around four in 10 nationals watch films in English, a third listen to music in English, and nearly one in five watch English-language TV, fractions all roughly the same as in 2014. A small but growing portion of nationals are either willing to pay or have paid for online content in the past year, but figures depend on the type of content. 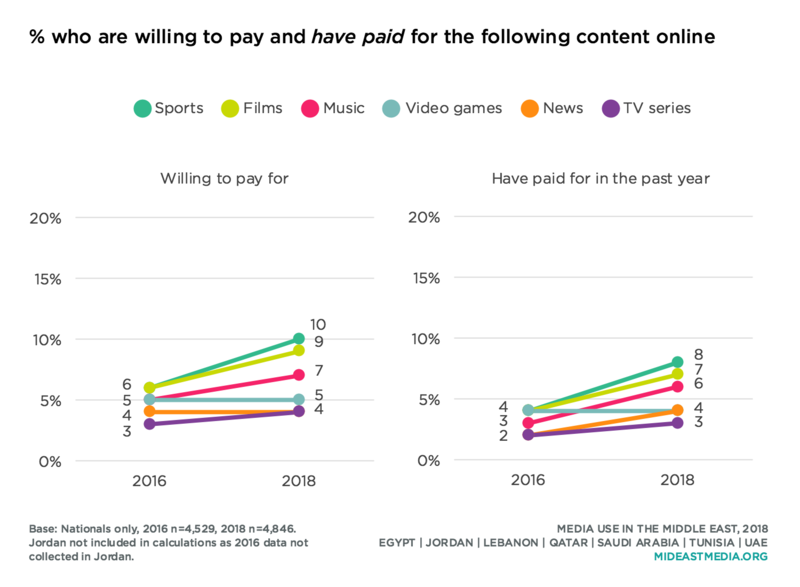 Close to 10% of nationals in 2018 said they are willing to pay or have paid for sports, films, and to a lesser degree music content online; willingness to pay for video games, news, and TV series have remained low since 2016. Most nationals have shared or commented online about some topic in the past month, and this figure has increased sharply since 2014 (any content: 28% in 2014 vs. 54% in 2016 vs. 62% in 2018). Nationals are most likely to share or comment on online videos—one third say they have done so in the past month—and about one in five or more have posted about music, news, and sports (34% online videos, 24% music, 19% news, 19% sports). Fewer nationals posted about films, ads, or TV programs in the past month (10% films, 9% ads, 6% TV programs). 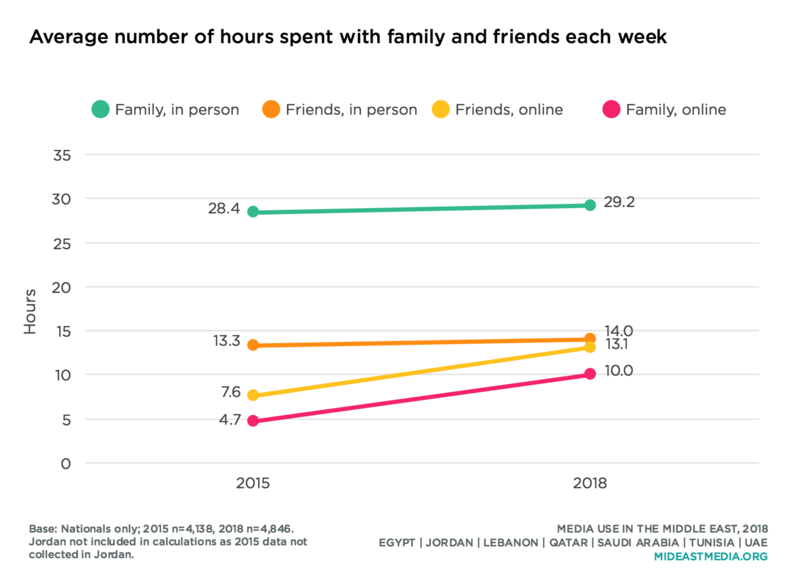 Even as both smartphone and internet penetration have soared in Arab countries in the last several years, the amounts of time Arab nationals say they spend with family and friends in-person each week has changed little since 2015 (29 hours family, 14 hours friends). Still, Arab nationals are communicating more with both friends and relatives online. The average amount of time spent each week online with friends and family each rose by five hours since 2015 (online friends: 8 hours 2015 vs. 13 hours 2018; online family: 5 hours vs. 10 hours). Men and women spend equal time online with friends and family: about 12 hours per week online with friends and 9 to 10 hours online with family. Men, however, average five more hours per week in-person with friends, and women spend six to seven more hours each week in-person with family (face-to-face—friends: 16 hours men vs. 12 hours women; family: 28 hours men vs. 35 hours women). Perhaps not surprisingly, younger Arab nationals on average spend more time with friends, both in-person and online, than the oldest nationals (45+), who spend more time in-person with family. The youngest nationals (18-24) average five more hours face-to-face and eight more hours each week online with friends than those over 45 years old (face-to-face: 17 hours 18-24 year-olds vs. 12 hours 45+ year-olds; online: 16 hours 18-24 year-olds vs. 8 hours 45+ year-olds). The oldest nationals, however, spend more time in-person with family each week than do nationals under 25, by five hours, but spend about the same amount of time online each week with family (34 hours 45+ year-olds vs. 29 hours 18-24 year-olds; online: 8 hours 45+ year-olds vs. 9 hours 18-24 year-olds).